The 2-floor luxury private villa is just 100 m walk from a long pebble beach with crystal clear water. Panoramic view on the Messinian bay to the west and on Taygetos mountain to the east. The villa, 100 sq m, comprised of living room/kitchen, 3 bedrooms (all of them with sea view) and 2 bathrooms, is situated in the middle of a 1,500 sq m. garden with grass, colorful flowers and various trees. It has well-functioning air-conditioning (in the bedrooms) which also works for heating and tile-roof. 5 min. drive to picturesque and lively Kalamata. Ideal for couples and families. Memorable sunsets. Kalamata city is only 5 km, offering beach front restaurants, shops and night life. Travel to Kalamata: From April to October direct flights connect several countries to Kalamata and Araxos (near Patras). Directt flights connect daily Kalamata to Athens (Aegean Air), Salonica and Crete. Driving time from Athens approx. 2 hours (250 km new highway). distance Patras - Kalamata is 210 km. Regular ferry connection to Crete. Messinian Blue Seaside Villa is a beautiful spacious home nestled in a luxurious garden. An unusual combination right on the bay and at the dorstep of Kalamata. The perfect place to visit all the sites of the Peloponeese. Accomodation and amenities were as presented in pictures and even better. Definitely a 5 star holiday home. Added to this was the generosity of Panos in helping us plan our trip to Greece. His knowledge of Athens, he lives there, and of all regions was most precious.He also was most helpful during our stay in his home, keeping us posted on what was going on in the area. My husband and I stayed six nights Oct 8–14 and definitely would recommend this home. The home was beautiful in great condition. The views of the water were breathtaking and the home is conveniently located from the town and beach. Panos was extremely kind and helpful and our stay was enjoyable for all three weeks we decided to stay in Kalamata. I would highly recommend the home and would stay again on my next visit. The BEST Trip! Paradise! Cannot wait to go back! I have been coming to Greece, Kalamata in particular, for most of my life. This summer we found this beautiful home to rent for our stay, and we thought by the looks of the beautiful pictures it must be too good to be true and something would end up not being quite as good as we expected, but to our wonderful surprise, we were completely blown away with our entire experience even from the very beginning of booking way before we even arrived. The owner, Panos, is a very special man. He went above and beyond at every turn, and took such special time and care to promptly respond to each and every random, even annoying request I came up with leading up to our trip. Not only did he research local grocery stores where I could find the exact kind of organic foods and goat milk for my baby that I was worried about finding, but he also went out and found me my exact diapers and wipes that my baby uses so that I wouldn't have to go through the hassle of going out to the store after our long travel. He made sure to stock up the house with water and fresh fruit and vegetables and coffee and treats, diapers and wipes and baby's milk, all right there waiting for me upon my arrival, making me feel so incredibly welcomed and taken care of, what a special way to be able to start your vacation. He and his wife greeted us upon arrival and were the most kind and friendly, helpful family you could hope for. We honestly felt like we were staying in our relatives home or something, that's how well they took care of us and all of our needs. As if all of that wasn't enough, they even went so far as to also help me find a trustworthy babysitter I could hire when needed during my stay, who turned out to be their neighbor, and close family friend. She turned out to also be a doll, and was perfectly capable and trustworthy and wonderful, and they helped facilitate the entire process too. They also were so accommodating with the arranging their cleaning lady to come when we would be out of the house and convenient with our baby's schedule. The above all speaks to how impressed we were at every single level of the quality of care Panos gave us from beginning to end of service! But what I also want to mention was just how charming & special this house really was too! It is a perfect location in Kalamata, prime to all the best beaches, tavernas and attractions! The sunset &ocean views are breathtaking! Clean, safe, well kept and fully equipped. Zero complaints! Forever grateful to Panos!! Unsere Familien-Gruppe bestand aus vier Erwachsenen und einem Kleinkind. Wir haben unseren dreiwöchigen Aufenthalt in der Villa Lena sehr genossen. Sie besteht aus einem das Haus umgebenden, großen, sehr gepflegten Garten mit vielen schattenspendenden Bäumen und der bestens ausgestatteten komfortablen Villa; diese bietet auf zwei Ebenen alles was wir benötigten - einschließlich der Küche, in der wir täglich unsere Mahlzeiten bereiteten. Das Anwesen befindet sich auf einer Klippe zum nahgelegenen Meer und bietet einen wunderbaren Blick auf die Messenische Bucht und Kalamata und die sie umgebenden Gebirgszüge im Hintergrund und abends auf prachtvolle Sonnenuntergänge. 150 m Fußweg zum Steinstrand unterhalb mit nur wenigen, einheimischen, Badenden, das Wasser einladend sauber und warm. An der Straße, an die das Anwesen angrenzt, nahe gelegen zwei preiswerte Food Markets (mit Metzger) für den täglichen Bedarf, Bäcker, Apotheke und Arzt sind auch nicht weit. Der Standort eignet sich gut für Sightseeing und Shopping in Kalamata und für verschiedenste Erkundungstouren in der weiteren Umgebung. Die Eigentümer der Villa, Panos und Lena (wohnhaft in Athen) standen uns telefonisch während unseres Aufenthalts bei verschiedenen Problemen mit Rat und Tat hilfreich zur Seite. Panos war auch so liebenswürdig, uns vom Flughafen abzuholen. Overall we had a pleasant stay at Villa Lena. The owners were very kind, welcoming, good at communicating with us, and the property was well organised, even with some initial freebies (some fruits, bottle of Ouzo). Basics such as soap, oil and vinegar, etc. were there too. The property is lovely and the garden magnificient. Also the garden is surrounded by walls all around so it's very safe for kids. The view of the bay is wonderful. - The third bedroom is a mezzanine inside the second bedroom (no door, just stairs to it). Fine for us as we were a family, but would not work for 3 couples as two couples would sleep pretty much in same room. - The description gives the impression of a semi-private beach available to the house. But it's not really the case. You need to walk 150m along the very busy road (no sidewalk - very dangerous for kids) before going down another 50 meters to a beach mined by sea urchins. So we didn't use that. The Hotel Messinia Bay let us use their swimming pool free of charge for the duration of our stay (we bought a few drinks and dined there once) so the kids loved that. So the house and owners get 5 stars. Then the noise takes it down to 4 stars. And then the innacurate description of the third bedroom and semi-private beach takes it down to 3 stars. - House is located 30 m from road; road is not highway, it is local road. Of course there is some traffic; but we did not have such a complain before. - Of course, house is not suitable for 3 adult couples. We do not accept such a booking; it is for a 6-persons family. - we do not mention anywhere that there is private beach since private beaches not allowed. Existance of urchins is a proof that the sea is clean. Anyway, we indicated the urcins-free ways to get into the sea. Panos, the owner met us close to the villa, and directed us to his lovely home. We arrived late, not aware that he would be driving back to Athens a 3 hr drive! They left some treats and watermelon which was very kind of them especially when we were arriving so late with two boys! . The house is well appointed, and geared for outdoor living, with a lovely massive marble table out in the beautiful gardens. Panos was very receptive to our earlier email questions, and issues such as the coffee maker not working a day after we arrived, and had it replaced immediately. The villa was very clean, well taken care of inside and outside. The small store across the way was wonderful to pick up small items, etc., and helpful in telling us we could park our very large 9 passenger van in the area, rather than trying to deal with trying to turn around on the property, which was hugely helpful. We visited Olympia as well as Stoupa in the area, local coffee shops and restaurants, and the fresh market, which was great to experience and pick up items for our Greek friend, Manos to cook for us! Kalamata was a plesant change from the touristy areas in Greece that we had visited prior to our arrival. The ride from Athens to Kalamata is gorgeous through the mountains, and tunnels, on a wonderful highway, with stopping at Cornith along the way, where the boys saw someone bungee jumping! . Definitely recommend this property to everyone. A great place to return to after a busy day out and about. 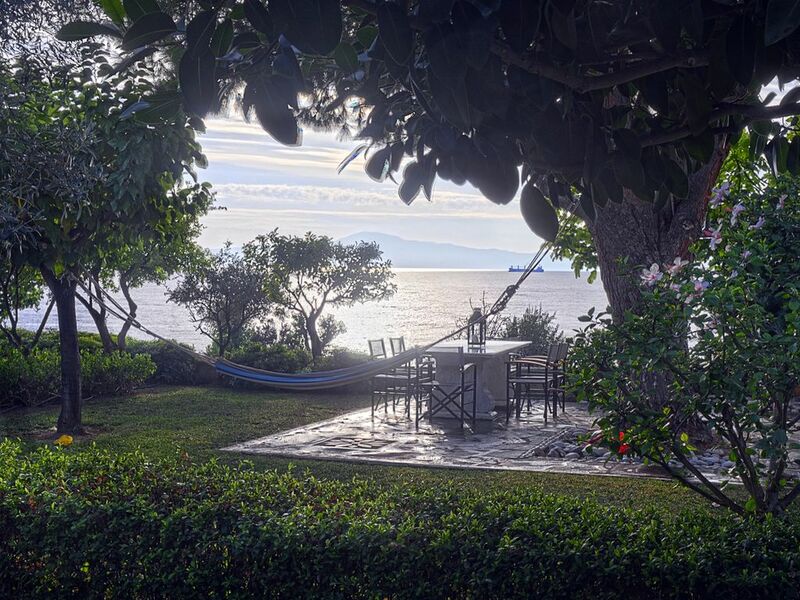 Great breezes and a relaxing garden to sit in and have dinner with the great sea view looking back to the town of Kalamata with their lights, etc. Very relaxing. .
Peloponnese (south edge of mainland Greece) displays a large number of historical sights, a rich partition of coasts, a hinterland with beautiful nature, villages with remarkable architecture, developed cities and a high touristic infrastructure. It boasts the largest and most spectacular concentration of ancient sites, including Mycenae, Epidavros and Olympia, where the Olympic games were founded. Equally fascinating are the many Byzantine (medieval) cities, churches and fortresses, including the hill town of Mystras and the sea-rock of Monemvasia. The rugged Mani peninsula, central of the three ‘fingers’, positively bristles with towers and frescoed chapels. Day trips can easily be arranged to historical sites (Olympia, Mystras & Monemvasia). You can also explore (by boat) the famous Diros caves. Kalamata (7 km) is a lively, typical Mediterranean city. The old town is picturesque with cafes, restaurants and shops selling local products. Walking on the sea front (2.5 km) is a pleasure. - A non-refundable 25% deposit is required on booking. Final balance is required 1month before arrival. - Bed linen & hand/face & bath towels provided - Villa fully cleaned prior to guest arrival. - There are NO Extras to pay. All services and equipment are included in the rental rates shown on this web site.